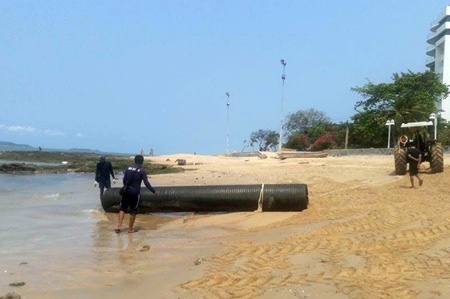 Breakaway pieces of the failed Pattaya Marina churned up a storm on social media, with online users wondering what the mysterious “black pipes” were seen floating off Yim Yom Beach. Photos posted to the Pattaya Watchdog Facebook page taken by an unknown foreigner drew dozens of comments and shares earlier this month. 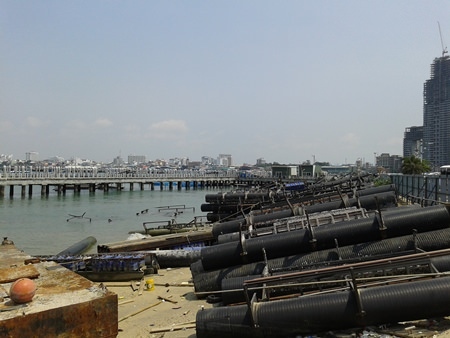 It turns out the “pipes” are pieces of the buoys used to surround the 700-million-baht Pattaya Marina, which was built between 2008 and 2014 and never opened due to repeated problems and funding shortages. Weather is tearing apart the unmaintained docks and breakwaters, with parts making their way to the shore off Pratamnak Hill.